Fortress Bukelon the village Matochina is one of the best preserved military buildings in Bulgaria. Fortress Bukelon is located on a high plateau close to the village Matochina. A high plateau, which dominates the surrounding areas of Bukelon is part of the ridge, which rises high in the transition from lowland river Tunja here. 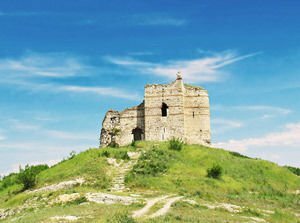 In this part of south eastern Bulgaria, Fortress Bukelon is located on the east bank of the river, situated about 40 km northeast of Svilengrad and about 10 km east of the village Sladun. Very close by here is the Bulgarian-Turkish border. Fortress Bukelon by the village Matochina stands on the hill, which is visible at the northern end of the village. Possible reason for to this is that this is the only military fortification in the village. Today, the ever impressive Fortress Bukelon lies in ruins, but they are sufficient to obtain an idea of its military power. At the outset of the hill Bukelon was once built a firewall, which until now has remained only briefly ruins. Fifty meters after the wall is located the actual Fortress Bukelon. Once when it was built, it was the closest guard to the north of Adrianople. In literature it is often described as a Roman "Castro", built in opus mikstum. It has served as the frontline of the town of Adrianople, which then was known as Edirne. In the circumference of Bukelon, you can see the remains of the tower, whose height is about 18 meters. It was built and restored in 12-14 century. This tower is a really impressive sight when you look at it from afar. From the very outer fortress traces are practically negligible. Visible on the plateau and some equipment and facilities, such as tank, places for religious purposes and others. It is believed that Fortress Bukelon on the edge of the village Matochina was built during the Roman Empire. Over 387 years near Bukelon is conducted a major battle between the troops of Emperor Valens and the Goths. This battle ended with a loss to the Romans and the death of the Emperor. At the side of the front door of Bukelon, Cross has built a brick monogram that suggests who was her ruler in the 14th century. According to the letter designations, that is Tsar Mihail. According to historical data, in 1328 Bulgarian Tsar Mihail waged long battles against Andronicus III and followed on down to Dimotika. There are suggestions that the way Tsar Mihail has resided briefly in Bukelon and had undertaken restoration of the fortress. The entire fortress Bukelon by the village Matochina is about 65 meters wide and 150 meters long. Tower and walls of Bukelon are built of stones, in layers of 4 rows of bricks, cemented with white mortar. The top floor of a semi-cylindrical shape probably served as a chapel. Battlements are located on all sides, but they is reached by wooden stairs wooden stairs. Fortress Bukelon is one of 100 national tourist sites of the Bulgarian Tourist Union. A curious fact is that the region itself and the fortress is where the Bulgarian film "Mila from Mars" was shot.